The Ogden-Hinckley Airport was named after Gordon B. Hinckley’s cousin, Robert H. Hinckley. Robert was an aviation and transportation pioneer, putting Ogden on the map with an expanded airport, and helping in the World War II effort. The Ogden-Hinckley Airport, which at the time was located where the current Mountain Star Hospital sits, was a huge training ground to teach World War II pilots how to fly. Robert helped launch the program with his friend Dean Brimhall when they created the Civilian Pilot Training Program. Robert was appointed by President Franklin Delano Roosevelt to the be chair of the program in 1938 and he worked with Brimhall and Art Mortenson to make the dream of training people to be pilots a reality. When it began, they were interested in teaching people to fly so the United States would be at the forefront of aviation, but it also proved to be vital to helping the United States in the war effort, training would-be pilots to go to war. Prior to starting the training program, Robert brought his family to Ogden from Mt. Pleasant, Utah, a small farming community. 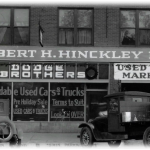 They considered their move to Ogden a move to the big city and Robert opened a Dodge dealership that would remain open for decades and be the go-to place to buy a Dodge in Ogden. Around that same time, he and Brimhall co-founded Utah Pacific Airways and it became the largest fixed base operator in the Rocky Mountain Region where it specialized as an airplane dealer, charter and school. Robert was always one to see a need and get things done so when the Great Depression loomed large, he helped with relief in Utah and his efforts were noticed by FDR. He was asked to take part in the New Deal and oversaw various programs and in 1938 was appointed as the head of the Civil Aeronautics Authority. That is how he was able to get the pilot training program started at universities across the nation and some non-university locations – like in Ogden. Because of this program, the number of trained pilots for the war effort in the United States jumped from 25,000 to 100,000 and Ogden played a major role in that effort. The famed candy bomber, Gail Halvorsen, was one of the pilots trained in Ogden. Halvorsen thought he was “too poor” for college, but told Carolyn Nibley Suhkan in an oral history interview that he could afford the flight school. He and Robert became friends and Halvorsen’s kind act of service to German children of dropping “candy bombs” to the starving children made world headlines. Both Robert and his friend Brimhall sent sons to war – all three of the Hinckleys came home – but Brimhall’s son was killed in action in France. It wasn’t long before the Civilian Training Program was turned into a military operation and Mortenson oversaw the training of 500 Navy V5 Cadets. By 1943, Robert helped create a plan for an expanded airport in Ogden – in a better location farther away from the mountains. Because of his work, he received word that the airport would be named for him. He attended the grand opening celebration – on the now Hinckley Drive in Ogden where thousands of locals showed up for the event. The Ogden-Hinckley Airport is now a growing airport with some commercial flights and numerous private flights. There are restaurants and car rental businesses at the airport with plans for further expansion to be led by new airport manager, Bryant Garrett.